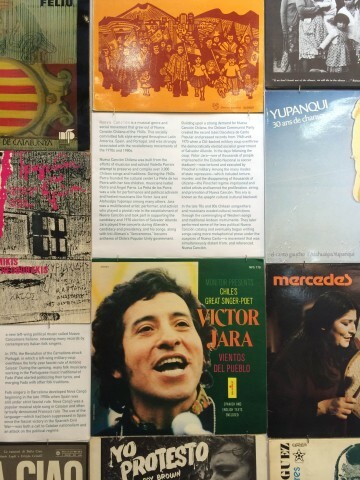 When thinking of political movements and the artifacts they leave behind, music isn’t necessarily the first medium to come to mind. But oftentimes music plays a crucial role in social movements – the medium is reproducible, easily distributed (especially more recently over the Internet), and acts as a highly participatory art form that relies on cooperation between artist and audience. if a song could be freedom…Organized Sounds of Resistance, currently on view at the Interference Archive in Gowanus, Brooklyn, examines this reciprocal relationship between music and social movements. The exhibit is made up of artifacts from Interference Archive’s collection as well as ephemera donated by supporters of the Archive. 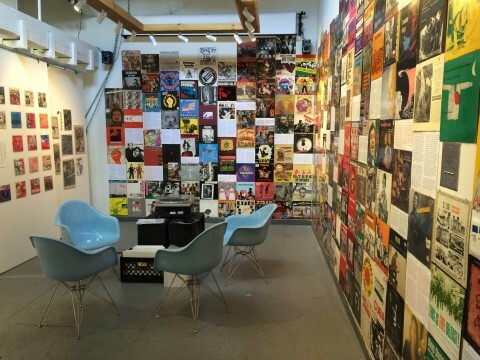 It is split between two rooms; one houses a wide array of punk zines, books and posters, and the other functions as a listening room where visitors can listen to the music featured in the exhibit. We were able to visit the space and interview Kevin Caplicki, one of the co-founders of Interference Archive and an organizer of if a song could be freedom. Read the interview below. UDL: Can you tell me a little bit about the Interference Archive project? 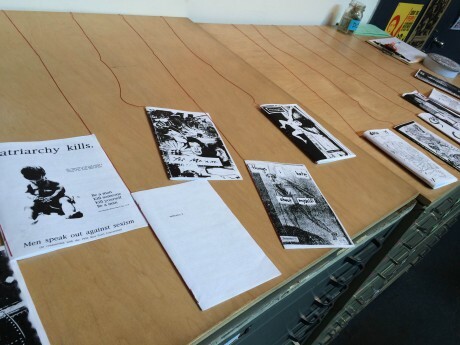 KC: The Interference Archive is a collection and exhibition space in the Gowanus neighborhood in Brooklyn. We collect all different kinds of mediums, focusing on what we call “the cultural production of social movements.” And it can be objects ranging from patches and banners to posters, to pamphlets, books, underground newspapers. Our criteria for the objects is: anything that is produced in multiples. We opened in December of 2011 to the public, and the collection grew out of the work and research of two of my friends, Josh McPhee and Dara Greenwald. They are cultural producers themselves and have been involved in multiple campaigns and in different forms of political activism. They were doing all this research about these kinds of material which culminated in an exhibition called Signs of Change which was in held at a non-profit art gallery space in Manhattan called Exit Art in 2009. In their explorations for the materials they were finding a lot of institutions that were kind of unfriendly to pedestrians – they’re not very open, they’re not very welcoming. 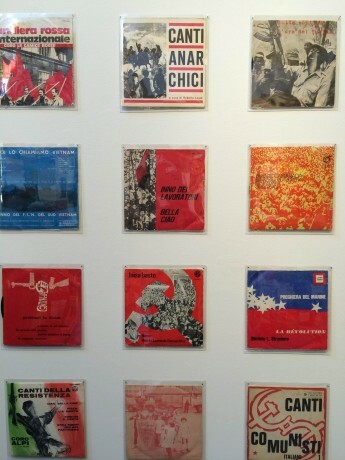 The idea being: this material was created by people to communicate various social struggles. They felt that it did the objects more of a service if they were available to the public, so they wanted to create a public space where the materials they had amassed could be made available to the public. Myself, Josh and Dara, and our friend Molly Fair founded this space in late 2011. Sadly our friend Dara passed away shortly after that, so this space is very much an homage to her memory and to her work. We have all this material, the stacks of shelves, the flat files – they’re all full of a variety of things, and we’re in the process of cataloging them. But we are open four days a week to allow people to come in and do research, to browse, also to just hang out and learn about social movement histories. We figured that one of the best ways to expose people to the materials was to hold thematic exhibitions of the materials. I think we’re on our fifteenth exhibition in three-and-a-half years or so. UDL: Who do you find comes here the most? KC: A variety of people come here. We get a handful of people that will come in and actually do research. We get some people that will come in to check things out and rummage through boxes and explore and see things. Some people – artists – are doing visual research. And we do a handful of workshops with high school and college kids. One of our inspirations for our physical space is the idea of the European squatted social centers, and the anarchist infoshops and bookstores, which were very ubiquitous in the 1990s and early 2000s. But they became social spaces where people could congregate, talk about politics. There would be a library of books. There was a variety of activities that happened in these spaces and we wanted to cultivate that kind of culture for people to be able to build networks, critique things, make relationships, and preserve these histories. Earlier on we got a lot of international visitors because it seemed like our promotion was being done a lot in Europe. With the exhibitions, those generally target more specific communities of people depending on the theme. More recently we did an exhibition about political prisoners called Self-Determination Inside/Out that definitely accessed a lot of anti-imperialist activists from the ‘60s and ‘70s, and a lot of the prison-organizing community. For the Serve The People: The Asian American Movement in New York exhibition, there was definitely a lot of student activists and a lot of people that were involved in those movement spaces in the ‘70s and ‘80s. So some of the Chinese-American community came out for that. UDL: Does the Interference Archive focus on a specific time period? It seems like it focuses mostly on the twentieth century. KC: We’re an all-volunteer run space and we are community supported so our funds limit what we can collect. The collection originated from the founders’ personal collections of materials from campaigns they’d been involved in. It’s definitely mostly objects from the later part of the twentieth century and from the twenty-first century. A lot of activists from the ‘60s and ‘70s will donate various materials to us, so that’s about as far back as our collection goes. We do have a couple of older artifacts – and we’d love to have more – but we’re limited because the older and more rare they are, the more valuable they get, so we’re unable to purchase those things. UDL: Is the current exhibition, if a song could be freedom…, the first time you focused specifically on music? KC: The previous exhibitions had more focused themes. We’re always trying to find ways to expose people to the breadth of materials that we have. The founders – myself include – were politicized through music, and it’s a medium in our collection that gets the least amount of use. So we decided it would be a good opportunity to showcase the record covers because of music’s significance to all of our political trajectories. And to get it out of the boxes. KC: We do have a large section of riot grrrl material because Dara Greenwald, a founder, was heavily involved in the riot grrrl movement in the early 90s. Our first exhibition was called Punk Feminisms. We showcased some of that material in the first show, and we felt it was appropriate to include a lot of those objects in the current exhibition, too. We have the exhibition split up. This room is the “punk room.” There’s a lot of ephemera like flyers and seven inches and zines and posters because these are things that we’ve created or that we were involved in. They’re all bands that have influenced and helped shape us. That’s why there’s such a focus on punk, because it’s something that the organizers participated in. UDL: How did you go about curating all the other material, then? KC: We wanted the exhibition to be a survey of international social movements. It seemed kind of obvious that reggae would have a place in it, and the genres it influenced, like ska. We discuss things like The Specials and their song “Nelson Mandela” because they had a larger cultural impact and influence. It’s all been pretty broad because we left our definition of “political music” pretty broad. We were also limited to the materials we actually had and what we could get from people we know. But we definitely wanted to have as international a scope as possible. We have South African labor songs – a couple of African countries are represented in the show. 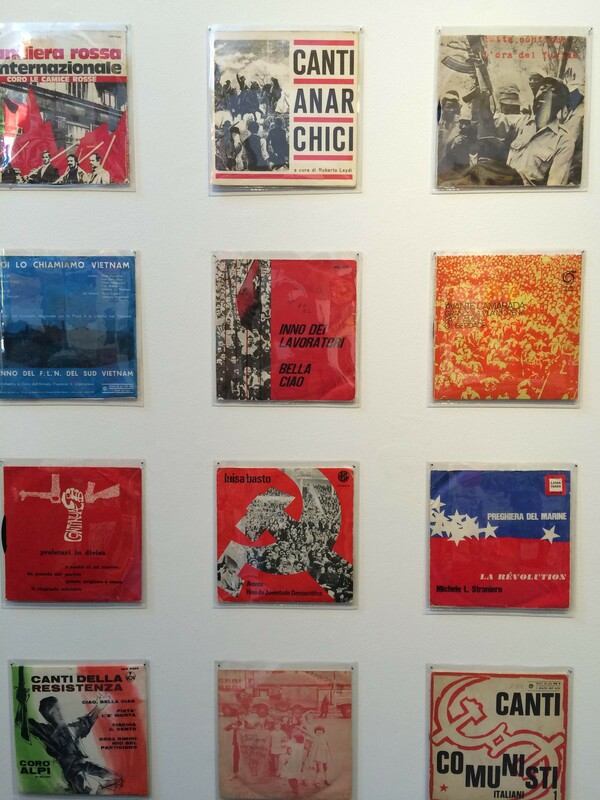 We have a handful of Italian seven inches that were produced by labor movements and different social movements in Italy. So those are these incredible documents of independent production by the movement, for the movement. It varies from hands-on independent, DIY spirit of punk to these other social systems like labor unions, all the way to more mainstream major label releases. Another thing we thought was necessary to represent was the Rock Against Racism concerts in England, which were organized in response to a racist, xenophobic comment that Eric Clapton made at a concert about how England should be white, and immigrants should go back home. So that was definitely cross-subculture and cross-genre organizing between a lot of the Rastas and punks. Another element in the exhibition is a survey we conducted with people who are part of our network, asking them what their favorite politically-influential songs or albums were, and then we attempted to get copies of those to put in the show. A lot of what’s on the walls is a survey of what activists and organizers and musicians wanted to see in the show. The album covers in the show are interspersed with those responses. We were informed by our own experience and by our own network’s experience of what political music is in the show. UDL: So what’s the goal of the exhibition? Is it purely an archival project or is there a larger theme at play? UDL: And there are other events built around the exhibition too? KC: Yeah, with each of our events we have a lot of programming. On August 5th from 7-10PM we’re going doing a political song karaoke night off-site. On August 16th from 2-5PM we’re hosting a listening party where people can come and bring political records and listen to them and talk about the songs. Just to have a sharing session of different music. We’re pressing seven inch EP record of long-since out of print songs that will be from our exhibition catalogue. There’ll be a record release toward the end of August. A friend of the archive is organizing a singalong of old labor and protest songs in the space, which’ll be on August 28th at 6:30PM. UDL: Awesome, thanks for taking the time to do the interview!